In order to combat the threat of dangerous anthropogenic climate change, the UK government has a target of 80% CO2 emission reduction by the year 2050 against 1990 levels. The UK emits 595.6 mt of CO2 eq per year and, of this 27% is due to the housing stock; hence a major reduction must be made in housing emissions, both operating and embodied. By the year 2016, all new build in the UK will legally be required to be zero carbon. However, the introduction of zero carbon homes is not enough; 66% of the housing stock to be occupied in the year 2050 is already built. In order to combat this problem, a massive retrofitting program must be undertaken of the existing housing stock, which makes up a total of approximately 26 million dwellings. ERDF Social Housing - This project has improved almost 400 social housing dwellings in South Tyneside and Northumberland. Narec’s specific part in this project has been interacting with residents, and measuring the improvements in thermal efficiency and comfort. 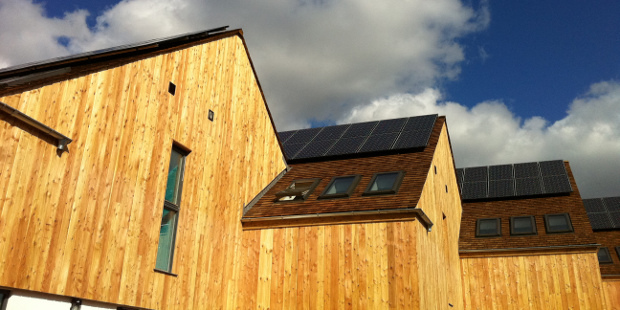 Sinclair Meadows - Narec Distributed Energy were involved in the design of a street of carbon negative homes. These homes are noe used as social housing.